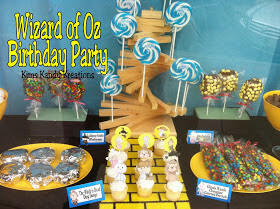 There are a couple of reasons why I chose the Wizard of Oz Birthday party by Kims Kandy Creations as today's Feature of the Day. Not only do I absolutely love The Wizard of Oz, but it also the day we are celebrating someone's actual birthday. (who also happens to love the movie) We even love the movie, Oz, The Great and Powerful. It was filmed in our state not far from our house, and one of her classmates is actually one of the extras, Kim went into great detail in setting up her Land of Oz dessert table. I think my favorite part is the"tornado" and swirly pops. To see all of Kim's Wizard of Oz Creations be sure to check out her website here. Thanks so much for linking up to Dare to Share Kim!